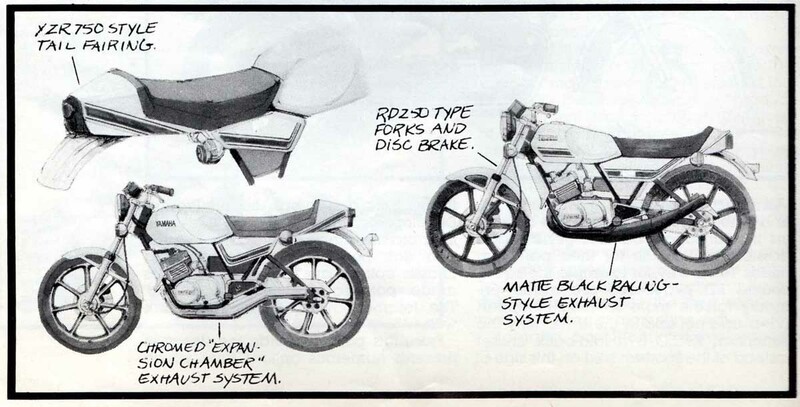 "The evolution of a motorcycle is a complicated business. Far more involved than the popular idea of a designer coming up with a model for the factory to translate into reality and for the marketing men to sell to the public. Indeed, the most complicated and important stage it all comes before the designer makes even his first stroke of the pencil. 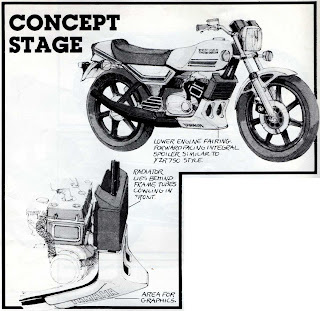 It’s the stage when the "product development" staff go through the throes of deciding just what style of motorcycle the public will be buying in the years ahead. 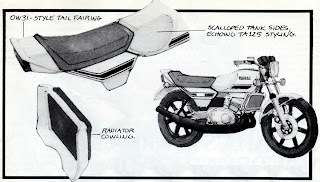 Masses of statistics are assimilated, market research conducted and, not least, the intuition that comes with years of involvement with the motorcycle industry is followed. Wrong interpretation of research or a wrongly-inspired decision at this stage translates into financial catastrophe in the long run, despite the best efforts of manufacturing or marketing stair. 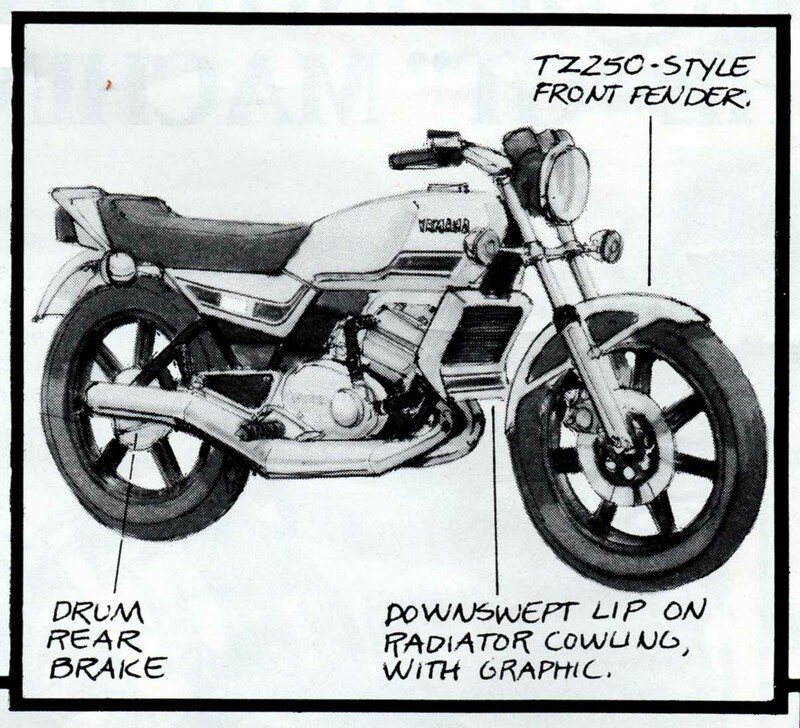 Yamaha has Product Development Managers in Europe, Japan, the U.S.A. and other major markets so that customers in individual countries get the best possible motorcycle tor their particular needs. 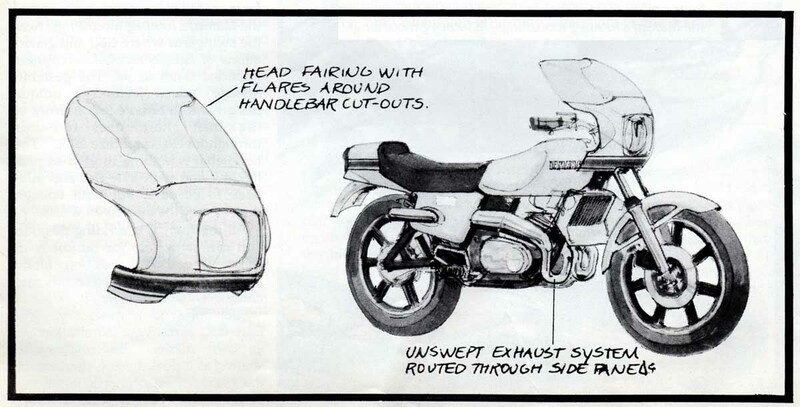 This is why, for example, the liquid-cooled RD two-strokes are made primarily for the more sporting European riders and not sold in the U.S.A. why the American XJ650 is a 1aid—back cruiser instead of the sportster sold on this side of the Atlantic, and so on. After the Product Development Managers have consulted their oracles, then consultations with design staff begin. 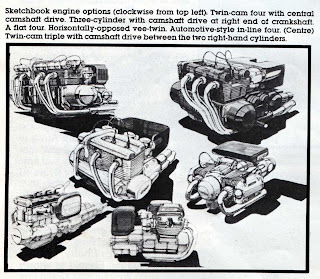 Various engine and chassis options are suggested, sketches made, potential specifications drafted. The designer now has a concept to work with. From this point onwards, the designer presents numerous options from which the final choice is made. Most of these options never progress beyond the sketchbook stage, some make it into prototype form . 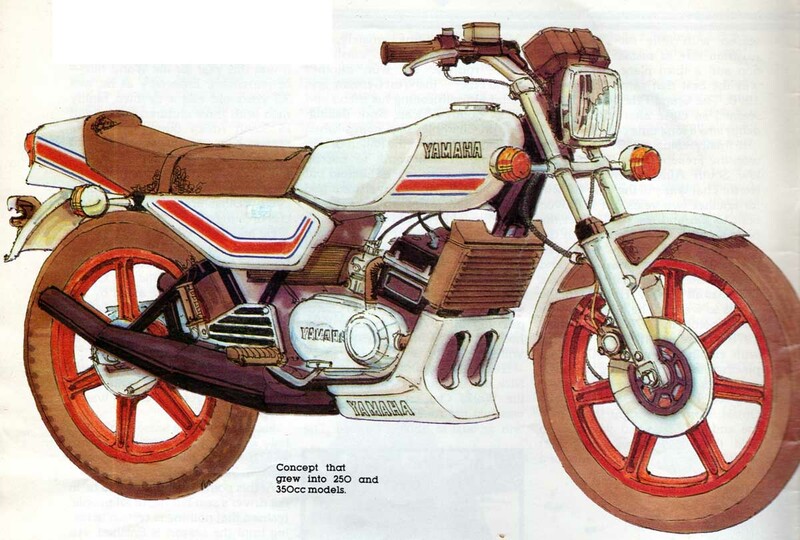 . . and just one finally becomes the bike that you can buy. 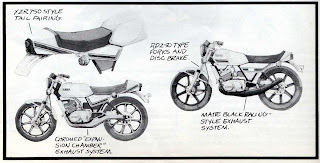 This feature gives you an idea of the various concepts presented by designers before a motorcycle goes into production. As you can see, some of the concept sketches are very close to models that motorcyclists are now well familiar with . . . the twin-cam 750cc triple, for example. 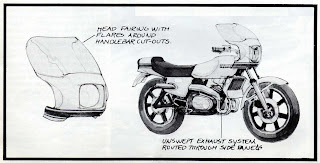 Other, such as flat-tours, vee-twins and in-line tours, never made it past the concept stage. Yamaha Europe commissioned concept sketches tor a sporting machine which form the bulk of this feature. 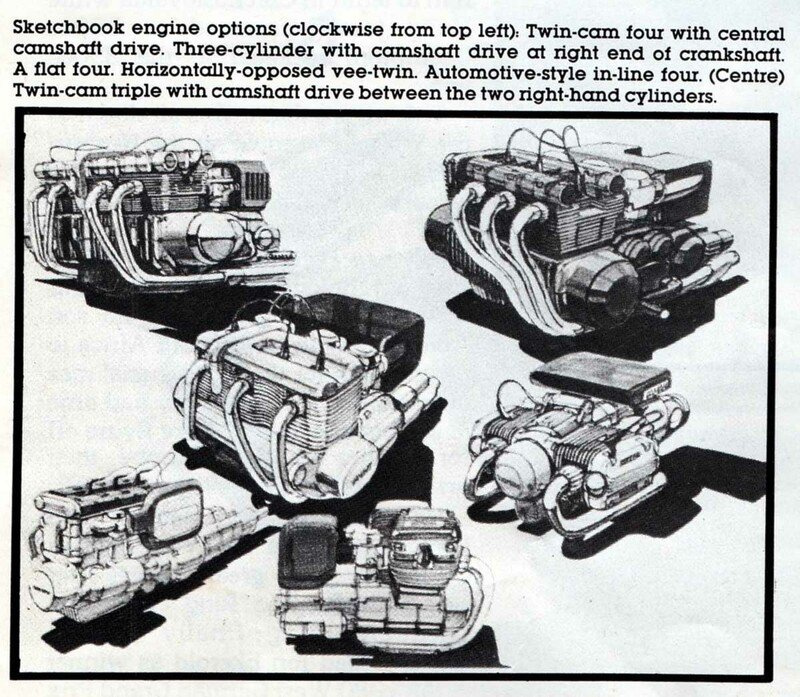 The sportster became the RD250 and RD350 "Liquid-Cooled" super sports machines. 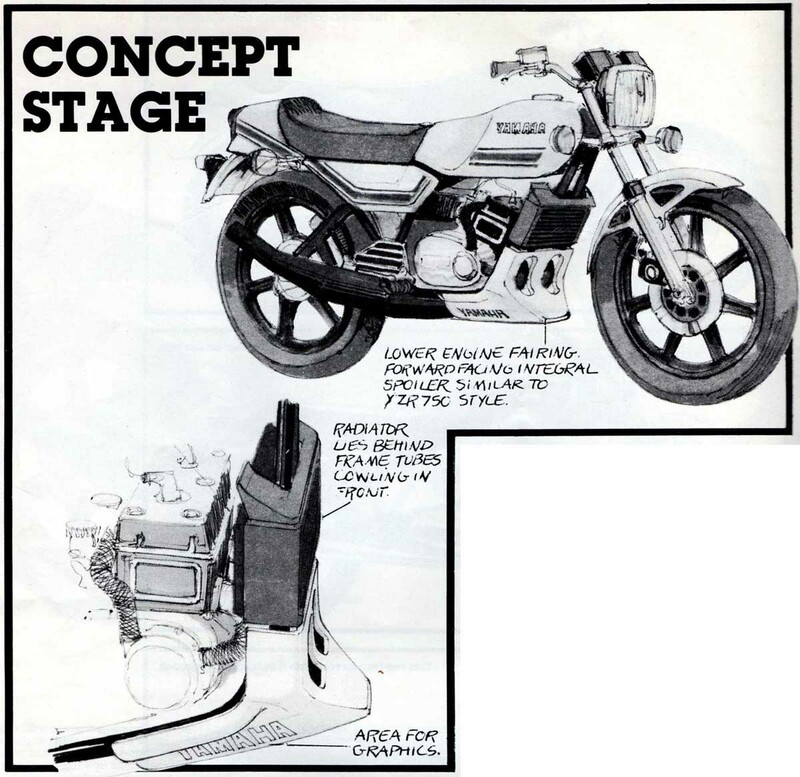 Motorcycles that were so sensational that they swept both over-all and capacity class honours in the "Machine of the Year" contest voted upon by the 200,000 readers of Britain’s leading bike newspaper, "Motor Cycle News"!